Slackware 14 by default carrying PHP-5.4.7 and running smooth well, BUT unfortunately it doesn't come with PostgreSQL, after searching for a while, i decided to install PostgreSQl from scratch. 8. Run this command su postgres -c "initdb -D /var/lib/pgsql/data"
Now, the hard part ^^, actually after you find solution, you will said...Hhhmmm just like that hah :D, because PHP-5.4.7 inside Slackware 14 is not compiled using --with=pgsql option, and because i don't want to touch anything about PHP that i'm already set all option and some configuration running smothly on PHP-5.4.7, and also because my server is used for production. 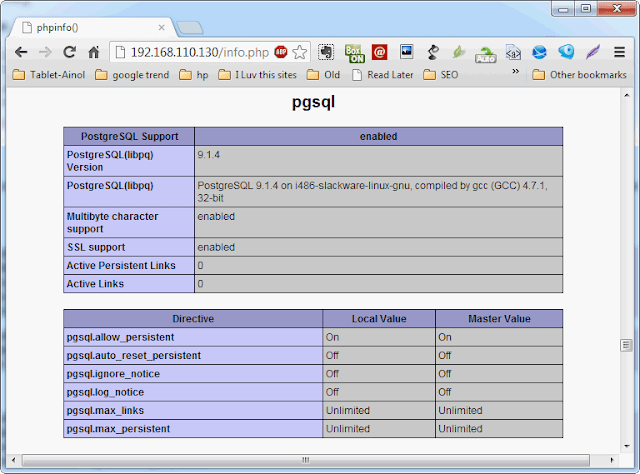 the point is, i just want to add pgsql.so into php.ini. That's it, nothing more. 7. mcedit php-pgsql.info and change, change version and MD5SUM too. If everything okay, you will get pgsql as result.